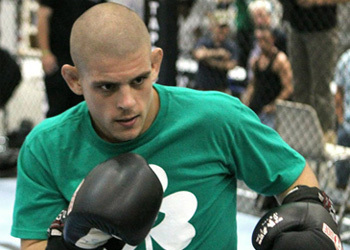 Former WEC lightweight champ Anthony Pettis recently requested a fight with Joe Lauzon (Pictured). On Thursday, J-Lau stated he’s more than willing to oblige. However, “Showtime” will have to wait until February if he wants a piece of Lauzon. “Me, Anthony Pettis; Pettis wants to fight me, I will gladly fight him,” Lauzon stated. “The UFC would love to put the fight together. I have tons of respect for Pettis, [he’s] super exciting. The kind of fighter I like to watch and the kind of fighter I like to fight. So, if he can wait until February, then I say we do it. I think it would be a super good fight and I think everybody would love it. Lauzon owns a 21-6 professional record and was seen earlier this month serving up an upset special over Melvin Guillard at UFC 136. Seventeen of the submission specialist’s victories have been of the tapout variety. Pettis, on the other hand, scored his first UFC win on the same Houston, Texas fight card. The flashy striker showed off his refined wrestling game to hang a slit decision W on Jeremy Stephens. The UFC has three events planned for this February. The world’s premier MMA promotion will host a Super Bowl Saturday show on the 4th in Las Vegas, as well as two cards on the 25th (Japan on Sunday the 26th).